Celia Bowen, daughter of a magician, is bound into a duel at a young age. She grows up learning how to magically fuse her sliced fingers back together and turn jackets into birds and back again—an illusionist, only it isn’t an illusion. Marco, an orphan, is picked up by a man in a gray suit and bound into a lifelong competition against Celia. The arena—Le Cirque des Rêves. The Night Circus drew me in from the very start. I started the novel late one Friday night and finished it Saturday afternoon. The novel follows a wide array of characters, all involved in and interconnected to Le Cirque des Rêves. The two main characters, Celia and Marco, are the masterminds behind the circus. But there are stakes that neither magician knows exists, and they find themselves falling in love and creating a series of dangerous consequences for the circus performers as well as the patrons. 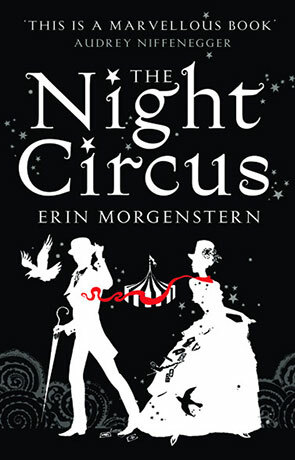 Erin Morgenstern weaves a beautiful world in The Night Circus. The novel moves from person to person, picking up at different moments in time, from the conception of the circus until the final act of the magicians duel between Marco and Celia. The split narratives work very well, flowing together so I was fully present in each person’s story without being caught up in the one before. Throughout the book, there are one to two page sections that lead the reader through a circus tent, as if on a tour. Morgenstern manages to combine just the right amount of explanation with description, leaving me wanting a little bit more but satisfied nonetheless. When I read about the circus, I was transported through clouds; I could smell the ocean and feel the sand, I could feel the cold of the ice garden. In short, I was impressed. When it comes to the characters, I was pleasantly surprised. The romance between Celia and Marco has a slow burn, but it eventually gets hot enough to burn both of them. Their romance was not the focal point of the novel, but a part of the overall story that naturally evolved without feeling forced. The beauty of the two main characters and their rawness wasn’t expanded upon as much as I would have really liked (Celia’s father slitting her fingertips open so that she could heal them, the man in gray leaving Marco alone for a large majority of his life), but the hints of it made the characters that much more flawed and wonderful for it. Celia and Marco aren’t the only characters that Morgenstern worked magic with, either. The book features tales of all of the performers in the circus, the group who works the circus behind the scenes, many beautiful characters. There are, in fact, about 15 main characters (a few too many, yes, but I didn’t notice the abundance of them while I was reading, only when I had to write a review). The character’s stories are just vague enough to make us feel like we might know them, but they are never fully revealed, leaving the perfect amount of mystery. Despite that Celia and Marco seem to be the main characters, there are so many other characters that held my heart just as tightly as they did, with their own stories and their own endings. The mood and atmosphere are the key pieces that make this novel what it is, not character development or even the (slightly slow) plot. Several reviews complained of one-dimensional characters, but I didn’t find that to be the case (remember to read between the lines). The slow pace and lack of action can easily put some people off—but if you are a lover of magic and of dreams, give this one a shot. Written on 12th February 2014 by Vanessa.